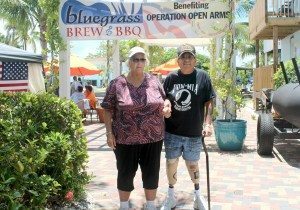 Matanzas on the Bay on Fort Myers Beach will host its fourth annual Bluegrass, Brew and BBQ event from 11 a.m. to 10 p.m. on Saturday, May 27 to benefit Operation Open Arms, a nonprofit organization dedicated to the care and treatment of Posttraumatic Stress Disorder (PTSD) in military personnel. The event will feature live music from the Bugtussle Ramblers from 1 to 4 p.m. and the Cooter Creek Bluegrass Band from 5 to 8 p.m., craft beer from Fort Myers Brewing Company, a 50/50 raffle and a $15 barbecue plate featuring ribs, smoked pork shanks, potato salad and corn on the cob, offered from noon while supplies last. Free car parking and boat dockage will be available for guests traveling by land or sea. Last year’s Bluegrass, Brew and BBQ event raised more than $7,000 for Operation Open Arms, attracting more than 800 guests to support the cause. This year, 50 percent of proceeds from the barbecue, 10 percent of all restaurant proceeds and 50 percent of the 50/50 raffle will benefit Operation Open Arms. 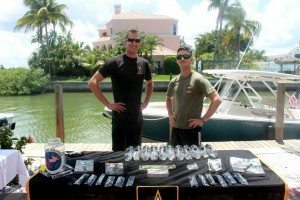 The event will also feature a silent auction, with 100 percent of the auction proceeds supporting Operation Open Arms. Operation Open Arms is a 501(c)(3) charity and nationally acclaimed military outreach program that provides active, foreign duty US service personnel every possible act of kindness through unique outreach services and PTSD mental health care within 30 days of returning home from deployment. For the past 12 years, Operation Open arms has continued to make a difference in the lives of more than 3500 U.S. troops returning from combat or foreign duty stations totaling $13.8 million in direct tangible benefits. For more information about the organization and its cause, visit www.OperationOpenArms.org. Matanzas on the Bay and Petey’s Upper Deck are best known for waterfront views, fresh seafood and old Florida ambience and is located at 416 Crescent St. on Fort Myers Beach on Estero Bay. The restaurant serves lunch and dinner daily, as well as caters to special occasions and private parties. As part of its commitment to use as many locally sourced products as possible, Matanzas on the Bay offers rum from the Wicked Dolphin Rum Distillery and draft beer from Fort Myers Brewery. Its upstairs sports bar, Petey’s Upper Deck, is popularly known for its Dave’s Dockside Pizza, named the best pizza on Fort Myers Beach. The restaurant is located adjacent to the Matanzas Bayside Inn waterfront accommodations, just steps away from the Fort Myers Beach entertainment district. Free car parking and boat dockage is available. To book your party or for more information, call 239-463-3838 or visit www.MatanzasontheBay.com.